John Noake Highmore was born in Milborne Port in 1809, the son of Wool Stapler (a person who buys wool from a producer, grades it, and sells it to a manufacturer) John Highmore (1781-1841) and his wife Elizabeth née Penny (1772-1869), the daughter of Henry Penny Snr (1746-1796) and Drusilla née Chalkley (1746-1822). John Highmore Snr had been adopted by his uncle William Reynolds Highmore (1755-1793) and inherited his property. This included the manor of Horsington, Somerset, which was previously owned by the Spellerberg family, from whom it passed to the Highmores via William Reynolds Snr who married Rachel Spellerburg. John and John Noake were in partnership as John Highmore & Son, Wool Staplers of Preston Plucknett until the partnership was dissolved on 1 June 1837 and a notice was placed in the London Gazette on 6 February 1838 (see below). Following the business split from his father, John Noake went into partnership with William Brook of Yeovil as Wool Dealers, Wool Staplers and Glove Manufacturers. In 1837 John Noake married Frances Churchman Penny (1815-1839), the third daughter of Henry Penny Jnr (1778-1855) but Frances died on 24 January 1839. She was aged just 24 and died during the birth of their son, John Henry (1839-1908). Frances was buried at St James' church, Preston Plucknett. In the 1841 census John Snr and Elizabeth, with their daughter Elizabeth and two domestic servants were living in Preston Bermondsey. John gave his occupation as 'Ind' meaning of independent means (John died later that year). Living with them (or immediately next door) was John Noake with his own two-year old son John Henry and two more domestic servants. John Noake gave his occupation as a Woolstapler. 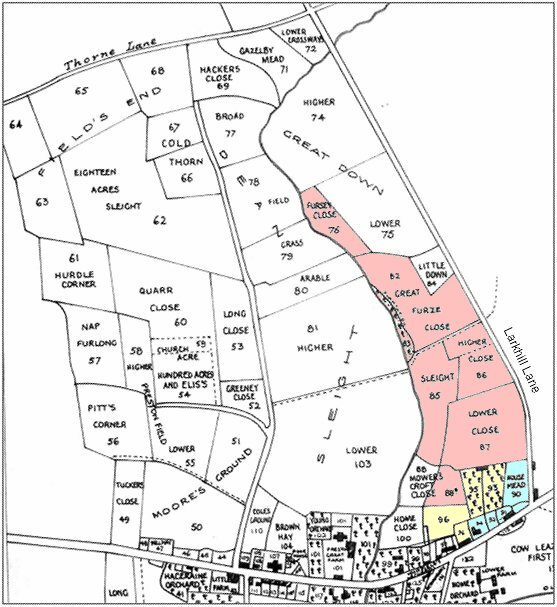 John Snr died in the autumn of 1841 and left a fairly large estate to John Noake running along the western edge of Larkhill Road and shown on the map below. These lands included the (probably) newly-built Preston House (in 1848 occupied by John Channett Sells, but later by John Noake himself) and Glencote, today known as The Old House, which was occupied in 1848 by William Longman. John Snr's widow Elizabeth was bequeathed what had been the Highmore family home on Preston Road (now the Preston Park Garage - see Gallery). In the 1851 census John Jnr was living with his mother there together with his cousin Susan Langdon who was a 'Lady's Companion' to 78-year old Elizabeth, and two domestic servants. 42-year old widower John gave his occupation as 'Woolstapler employing 2 Men and Farmer of 156 Acres employing 4 labourers'. John also owned a copyhold house and lands at Leigh, Dorset, occupied by a tenant, William Crocker. In June 1842 John was elected a member of the Royal Agricultural Society of England and he was a member of the Wincanton & Yeovil Society for the Protection and Defence of Agriculture and Native Industry in 1844 and holding meetings of the Society in his home in 1846. During the 1840s and into the 1850s he was Secretary of the Yeovil Agricultural Society. In March 1847 his partnership with William Brook was dissolved by mutual consent and later that year, following the breakup of his partnership with William Brook, John started the Yeovil Times and appointed Daniel Vickery as its editor. The Yeovil Times went through many changes of name, typical for the time, finally ending up being labelled "The Yeovil Times and Farmer's Price Current, Weymouth and Portland Star, Axminster Gazette, Agricultural, Manufacturing and Commercial Chronicle, and General Advertiser for Somerset, Dorset, Devon and the Western Counties". In 1851 Highmore purchased the Western Flying Post and amalgamated his Yeovil Times with it. 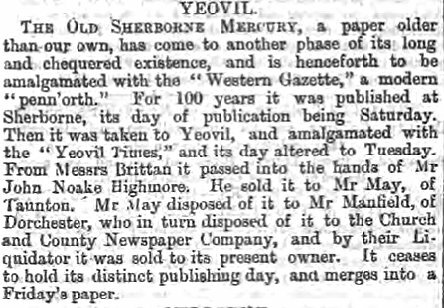 Publishing returned to Sherborne although it was printed in Princes Street under the title of "The Western Flying Post, Yeovil Times and Sherborne Mercury". John was still owner of the Western Flying Post in the summer of 1854 but it is likely that he sold the newspaper (to Mr May of Taunton) the following year since on 13 September 1855 at Edge Hill, Lancashire, John remarried. His new wife was Anna Coombs Warry (1801-1884) of Bath, the daughter of Robert Warry and Hannah née Coombs. In 1851 Anna had been a lodger in Preston Street (today's Preston Road) not far from John's home. In the 1861 census John and Anna, together with John's son from his first marriage John Henry, now aged 22, were living in Birkenhead, Cheshire, with a servant. John Noake gave his occupation as 'House & Land Owner' and John Henry gave his as a Merchant's Clerk. The family soon returned to live at Preston Plucknett however. On 21 May 1865, while staying at Bicton Villa, Torquay, Devon, John Noake Highmore committed suicide by hanging himself (or as the Exeter & Plymouth Gazette euphemistically put it "from affection of the heart"). The report of his death is shown below. His will was proved in July and his effects were valued at 'under £5,000' (that is, under about £4.4 million at today's value). John Noake Highmore's son, John Henry Highmore (1838-1908) was an interesting character, trading in Accra on the Gold Coast and fathering a mixed race son there in 1906. The son was named John Henry Hymore (1906 -1986) and began a line of the family that expanded in later generations and continues to this day. What John Henry Highmore’s English wife Mary Hearn Nunn née Smith knew of this affair is unknown! Two of her sons by John Henry died in Accra within months of each other in 1900. Many thanks to Chris Highmore for additional information. This map is based on the 1848 Tithe Map of Preston Bermondsey, showing land owned and occupied by John Noake Highmore in pink (today pretty much all of Monks Dale, Abbey Road and Abbots Way). The land shown in blue was owned by John Noake Highmore but occupied by others (including Preston House and Glencote, today known as The Old House) and that land shaded yellow was the Highmore family home and land, owned and occupied by John's mother Elizabeth in her own right (today the building is the Preston Park Garage). 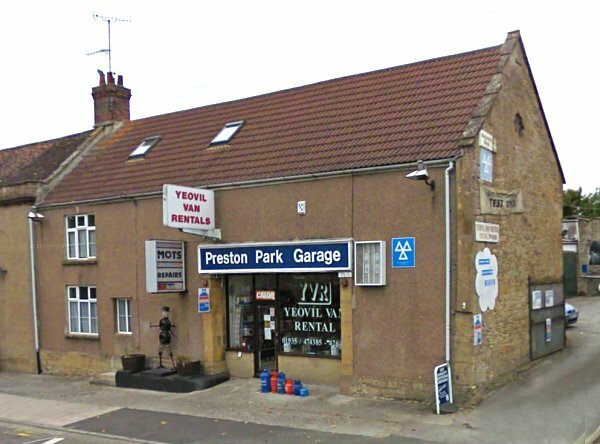 The Preston Park Garage, immediately next door to Preston House (today's Plucknett, off shot to right) was the Highmore family home and left to John Highmore's widow Elizabeth after his death. John Noake Highmore lived there with his widowed mother in 1851 before moving next door to Preston House. The notice of the dissolving by mutual consent of the partnership between John Snr and John Jnr placed in the London Gazette in February 1838. The notice of the dissolving by mutual consent of the partnership between John and William Brook placed in the London Gazette in June 1847. 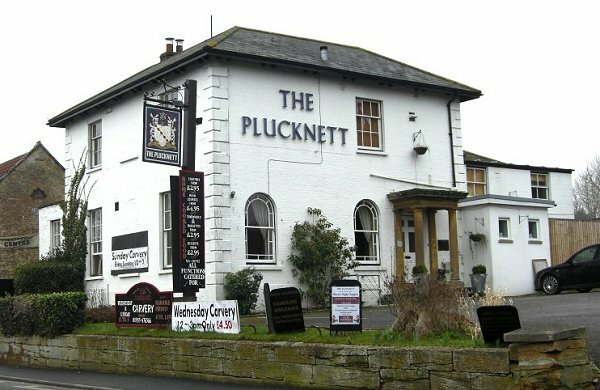 The Plucknett, formerly Preston House, home to John Noake Highmore during the 1850s and 1860s. Photographed in 2009. An article from the Taunton Courier & Western Advertiser's edition of 26 June 1867 outlining the ownership of the Sherborne Mercury. 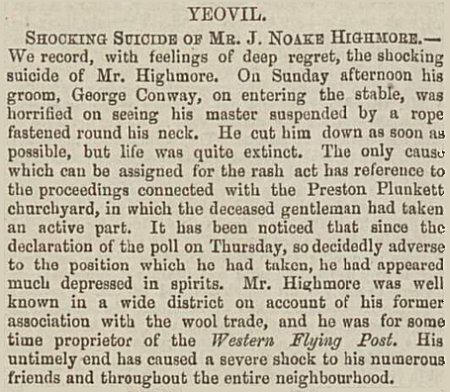 The report of John Noake Highmore's suicide as reported in the Dorset County Chronicle's edition of 5 November 1863.